Hydrating Eye Cream is an effective daily treatment containing Pineapple, Marshmallow and Calendula which all have a calming effect that smooths the appearance of fine lines and wrinkles. The skin around the eyes is the most delicate on the body and as such is much more prone to wrinkles caused by dryness. At any age an eye cream is an essential part of your skincare regime, and as this skin is so thin you must use a specific eye treatment and not just a facial moisturiser which may be too heavy for this area. Even the action of using an eye cream – by patting gently around the eye – will help reduce puffiness and dark circles, and help keep those wrinkles at bay! 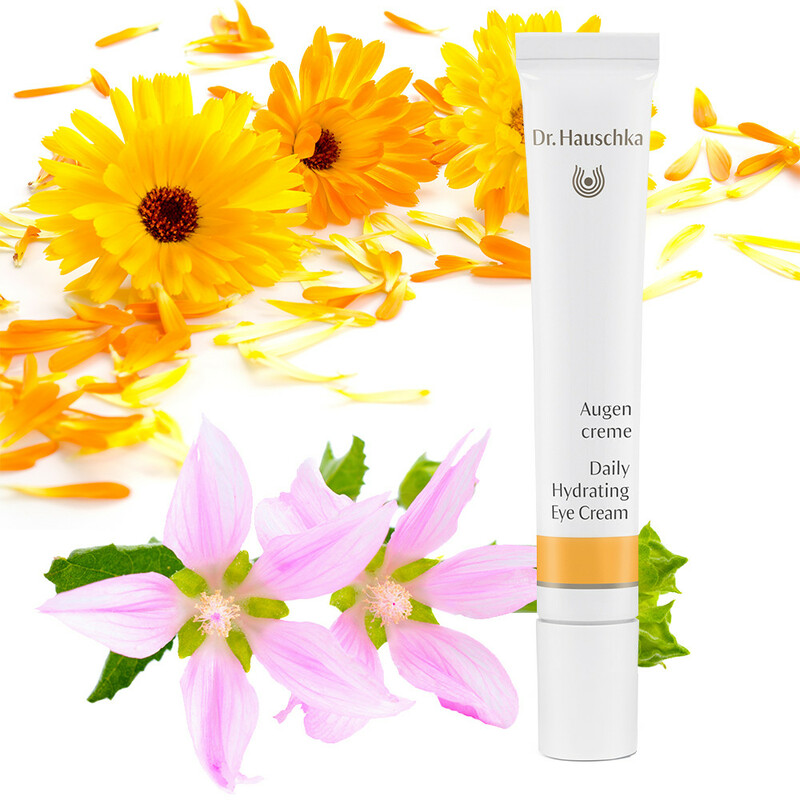 Hydrating Eye Cream by Dr Hauschka truly nourishes and hydrates this area, strengthening the skin from within for a refreshed look. Prepared using only the best natural ingredients including Rose Distillate, Pineapple, Marshmallow and Calendula to soothe and add moisture, and nourishing Avocado and Sweet Almond oil, whilst Macadamia and Sea Buckthorn relax even the most tired-feeling eyes. This cream is rapidly absorbed which makes it ideal to use just before applying your make-up. Application: Each morning after cleansing and toning, squeeze a small amount of product onto the tip of your ring finger then gently press Daily Hydrating Eye Cream into the skin around each eye, working from the inner corners outward. This product is ophthalmologically tested and suitable for contact lens wearers. Tip: Great reviver for tired eyes. Ingredients: Water (Aqua), Persea Gratissima (Avocado) Oil, Rosa Damascena Flower Water, Glycerin, Alcohol, Ananas Sativus (Pineapple) Fruit Extract, Althaea Officinalis Leaf Extract, Beeswax (Cera Alba), Calendula Officinalis Flower Extract, Arachis Hypogaea (Peanut) Oil, Hectorite, Prunus Amygdalus Dulcis (Sweet Almond) Oil, Rosa Damascena Flower Extract, Prunus Armeniaca (Apricot) Kernel Oil, Lysolecithin, Simmondsia Chinensis (Jojoba) Seed Oil, Macadamia Ternifolia Seed Oil, Mangifera Indica (Mango) Seed Butter, Butyrospermum Parkii (Shea) Butter, Hippophae Rhamnoides Fruit Oil, Chondrus Crispus Extract, Glyceryl Stearate, Stearic Acid, Xanthan Gum, Sodium Stearoyl Lactylate, Fragrance (Parfum)*, Geraniol*.